Pizza with the cheesy melted and stringy, macaroni and cheese like Grandma made it, tacos with cheddar cheese and sour cream, a frothy glass of milk, your favorite ice cream. These are all favorite foods in our diet. We can really run up the grocery bill buying the ingredients. How can we save on dairy? Check the price of milk at gas stations on your regular route. For years I bought milk at a Casey’s near my job. It was the cheapest milk in town. Remember the cost of gas when comparing prices. It is not worth it to drive out of your way to buy milk that is a few pennies cheaper. Stretch that gallon with nonfat dry milk. Mix up a half-gallon of nonfat dry milk using warm water so it dissolves completely. Combine it with a half-gallon of regular milk and you will have double the milk with no noticeable change of taste. It works best with whole milk or 2%. You are also cutting down the amount of fat you consume. Measure it. A serving of milk is eight ounces. When my husband gets a glass of milk he pulls out a 16 ounce glass. That is two servings. At mealtimes you could fill 8 ounce glasses with milk and set a pitcher of ice water on the table. When the milk is gone, refill with water. We don’t drink enough water anyway. Note: The doctor told us the reason kids are bigger and taller than we are was because of the hormones in dairy products. When we allow our kids to have unlimited milk and dairy products we are exposing them to more hormones. Cut it yourself. My husband likes a slice of cheese on his sandwich at lunch. I am a salad girl and I like chunks of cheese or cheese crumbles on my salad. We prefer real cheese over cheese food. We no longer purchase packages of sliced, individually wrapped cheese. We now buy a pound of cheese. I cut the end off to make the chunk the size of a piece of bread. David slices it up for his sandwiches. 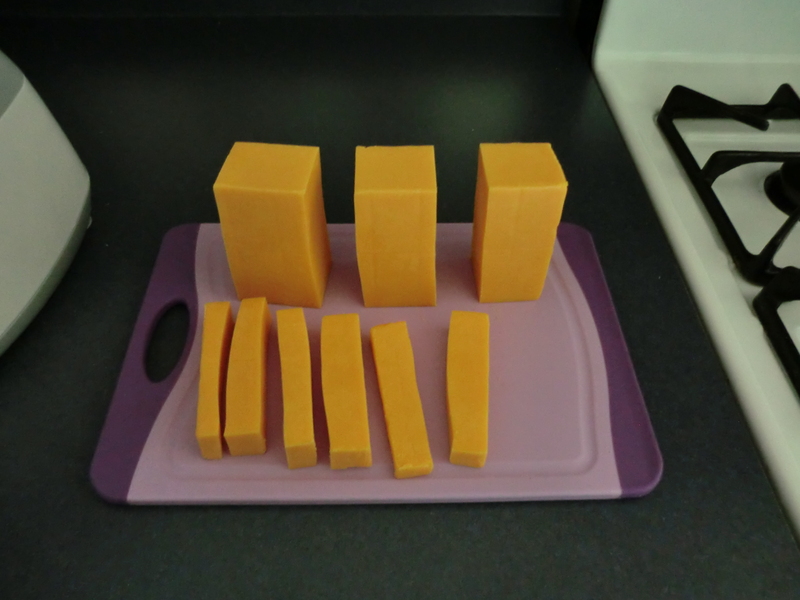 I cut the end piece into cubes and have enough for five or six cubes of cheese on my salad all week-long. Another trick is to slice the end and use two narrow pieces of cheese per sandwich. It goes a lot further. Shred it yourself. You can buy a chunk of cheese and shred it in your food processor. This does not work for all varieties of cheese. It is cheaper to buy it by the pound than to purchase bags of shredded cheese, see http://wp.me/pKNzn-cH. Protect your cheese. The secret to making your cheese last longer is to hold it with the wrapper. When your fingers touch the cheese the oil from your fingers can cause it to mold more quickly. Or wear plastic gloves when handling cheese. Always protect cheese from air. I store mine in Ziplock bags. Many varieties of cheese freeze well. When shredded cheese is on sale I stock up and freeze it. A cone, not a bowl. It is worth it to purchase cones. You cannot get as much ice cream in them as you can a bowl. Yet, it is just as satisfying as eating a bowl of ice cream. A trick to stop sugar cones from dripping is to put a miniature marshmallow in the bottom before adding ice cream. Portion control. I would get out a desert bowl when I had ice cream. The men in my family would get out an extra deep soup bowl and fill it. A half-gallon of ice cream is two servings to them. I made the “two scoops rule”. No matter what size of bowl, you could only get two scoops. When you are using a round ice cream scoop my rule worked well. When they got out the flat ice cream scoop…not so much. It’s amazing how much ice cream they can get on it! Bigger is better. I buy the 32 ounce container of vanilla yogurt and add my own fruit to a four-ounce serving. It is much cheaper than the single serving containers. Grow your own. I recently read at Debt Proof Living, that you can grow yogurt. Boil a half-gallon of milk and allow it to sit in a cool place. When lukewarm, add 1 Tablespoon Dannon plain yogurt, stir and cover. Let it sit on top of the stove overnight. It will be done the following day. This makes sugar-free yogurt. You can add fruit, honey or granola to sweeten it. Make your own. I found two methods of making sour cream at www.mahalo.com/how-to-make-sour-cream. If you’d prefer to have a little more control over the sour cream, here is a way to make it overnight. Sterilize a canning jar in boiling water Pour the cream and buttermilk into the hot jar. A higher percentage of butterfat in the cream will produce a thicker sour cream. Store in the refrigerator up to three weeks. Throw the sour cream away if mold begins to form on the top. Another way to make sour cream is using a blender. Pour the cottage cheese, milk and lemon juice into a blender. Mix on medium-high speed until smooth. Dairy can also be a budget stretcher. Replace a meat entrée with macaroni and cheese or have a grilled cheese sandwich instead of a ham and cheese. When you add eggs you can have cheesy omelets, cheesy egg bakes, etc. A new trend in cost cutting is to serve breakfast for dinner. The stuffed French toast you don’t have time to make in the morning can make a great evening meal. I would love to hear your tips! This entry was posted in Be Prepared, Food, Make It and tagged Be Prepared, Food, Make It by Frugal Fish. Bookmark the permalink.